It's well known that an artist becomes more popular by dying, so I'm typing this with one hand while pummeling my head with a frozen mackerel with the other. I've done art for several magazines, newspapers, websites, commercial and governmental clients, books, and scribbled on tavern napkins. I also create art pro bono for several animal rescue groups. I have an ebook at Amazon.com about my work in dog Rescue, Rescue Dog Rescue Me 1 and 2. 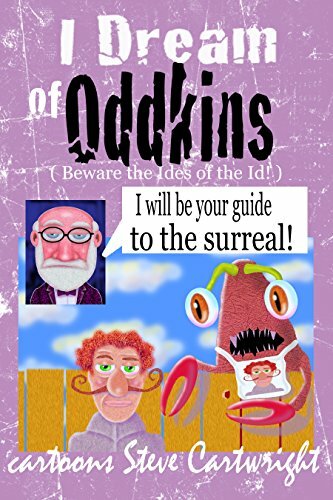 My collection of surreal toons, I Dream of Oddkins!, is also available at http://amzn.to/2uN0jlm . I have 3 horror stories in the anthology Dark Tails edited by Annie Acorn, also available at Amazon.com . I was awarded the 2004 James Award for my cover art for Champagne Shivers. I recently illustrated the Cimarron Review cover. Take a gander ( or a goose ) at my online gallery: www.angelfire.com/sc2/cartoonsbycartwright . No pixels were damaged whilst creating this site. And please hurry with your response - this mackerel's killin' me!